I have observed many people, listened to many people, counselled many people, and worked with many people one on one. To do what? To help them create a happier, simpler life. How do we do that? We begin to look at what it is in our life that makes us angry, annoyed, resentful, hurt. We look deep into that hurt. We study it, and we look at where we laid the blame. Then we look at how we feel. We look at what it is in us that the issue raises. The emotion, the feelings, both physical and emotional. We take ownership of that. This is truly that hardest thing, to take ownership of what we feel, and know that this is ours and no one else’s to own. What rose in us, is ours. Anything that rises in us, is ours. There are acts perpetrated by others that defy comprehension. Their acts come from a place of hurt and powerlessness, they come from a very damaged person, they come from a very ‘sick’ person, a weak person. No matter how brutal they try to appear, they are hurt, and their hurt and desperate feeling of powerlessness makes them lash out. The saying goes ‘hurt people hurt people’. They may make all sorts of excuses, tell you you deserved it, or it is your fault, or whatever, but just let that go too, for that is all emotional manipulation, which also comes from a refusal to take ownership of their own actions. If we continue to go round and round with the pain and trauma of what was done to us, we will stay in the cycle of keeping it all very alive, active, and in our energy field. It is the ball and chain from which we cannot move away. It not only is possible, but it is important that you let go, if you want to move forward. Each time you think about something that has happened, you raise it all back into your energy, you keep it alive and thriving. The more we are able to move our thoughts to something that we do want in our life, the more we keep that alive in our energy. Think of that which you do want, and think of how you want to feel, and let that be alive in your energy. We magnetise what we focus on, and that is why we see many people who stay in their pain their entire life, and it is also why we see people who seem to be happy all that time … and this is why we see people who seem to attract success to themselves! Focus on what you want! Seriously: Focus on what you want! What I have shared here are snippets of some simple things that may helpful, and I am by no means trying to trivialise anything anyone has been through … but … I have met too many people who are ‘stuck in their story’ and I do not wish that for anyone. I wish happiness and joy for us all! 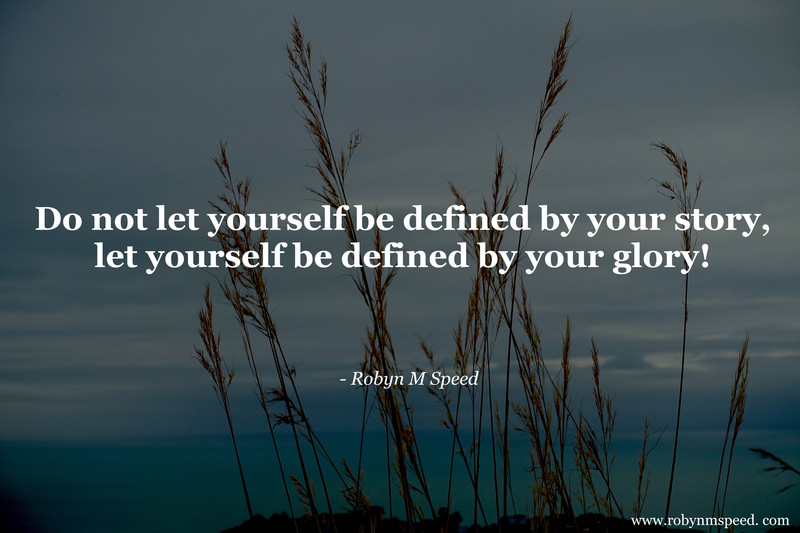 Do not let yourself be defined by your story, let yourself be defined by your glory! If you find value in what I share, it would be marvellous if you bought a copy of my novel, and let that take you on a unique journey of growth, through the avenue of story, as this would help support me in my own work and my own journey—for none of us is ever ‘there’, we are all on a journey. Much love to you. These seem to be challenging days for many … and I hold you all in my prayers.